Callmetony is a 2001 Kentucky bred dark bay gelding born April 26th, 2001 (Runaway Groom – Firey Comet, by Red Ransom). In his eight-year career, Callmetony (or Call me to New York as some people like to call him!) raced 85 times. He built a strong race record of 21-22-17 earning $666,446. He raced at Golden Gate, Bay Meadows, Emerald Downs, Hastings, Hollywood Park, Monmouth, Belmont, Aqueduct, Saratoga and Philadelphia Park (and Parx, too). Tony was claimed eight times and last raced in 2012. 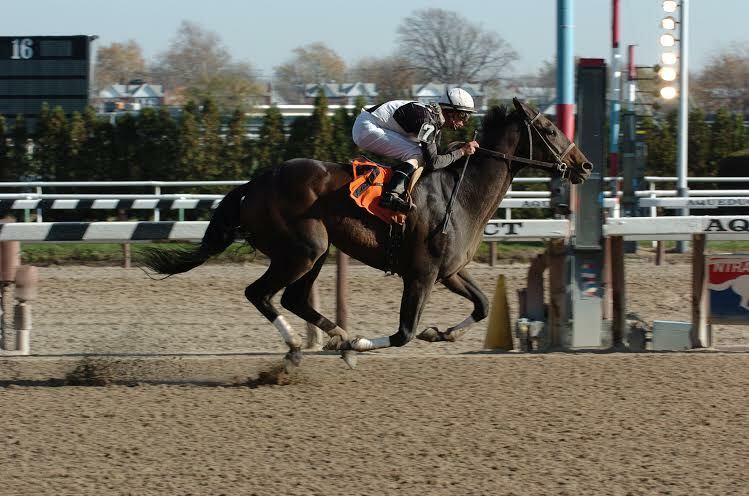 Tony had been claimed by and from Roddy Valente three times in his career, lastly in November 2011, when Valente lost him in a race at Aqueduct. He’d won in his last start for Valente and trainer Bruce Levine and had gone winless for his new connections, though he had at times been competitive in his eight races after the claim. On June 5, Tony was entered in a $5,000 claiming race at Parx, and when Valente heard on race day of the horse’s scheduled start, he made a phone call to his trainer at the Bensalem, Pennsylvania track. Valente, who comes from upstate New York and who campaigned the undefeated, Grade 1 Carter-winning Bustin Stones, claimed Callmetony for the fourth and last time that afternoon, and when he did, Akindale was waiting. Two days after his last race, he arrived in Pawling in 2012. Tony retired to Akindale, but quickly became bored with retirement. Tony is currently enjoying a few years with a loving family doing the show thing and loving his family. We could not be happier for them! Tony, when ready, will retire at Akindale with our Famous Residents, but for now, he is happiest with a job and his people. We cant thank them enough for loving him!